Give your live chat agents the power to provide instant customer support from anywhere. 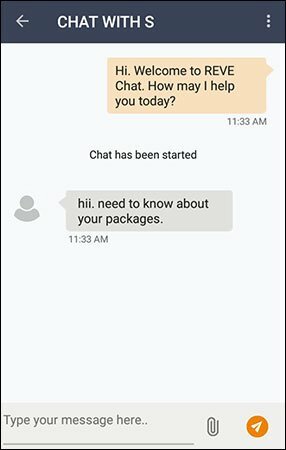 REVE Chat has recently launched its Android mobile app with which your team can live chat with customers who are on your website, Facebook company page and through Viber even while on the go. In short, it allows to manage the whole support functionality from your phone itself. All you need to do is just download the REVE Chat app from Google Play store and login with your registered email ID and password. That’s it. Monitor your website visitors in real-time from anywhere and proactively engage for offering assistance. Get notifications regarding new chat requests within the app itself. Manage the whole support functionality directly from your phone. Initiate new chats and respond to chat requests simultaneously from the REVE Chat app itself. 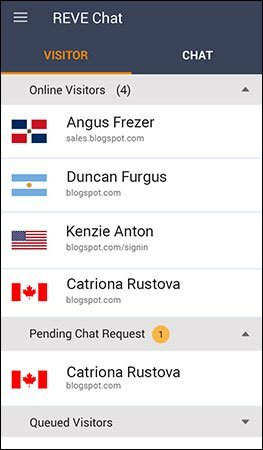 Get instant notifications regarding new visitors, live chat requests and responses when the android app is running in the background. For new chat requests, visitors, responses or any other events, the app allows you to receive both sound and vibration notifications. Get detailed chat transcripts between support agents and customers for future reference. Visitor data like geographic location, email address, current page views, IP address, browser, chat duration, past visits etc collected from multiple channels are available for instant review. The list of online agents are shown under ‘Agents’ section. You can share files as attachments in JPG, JPEG, PNG, TXT, PDF, ZIP formats from the chat window itself.